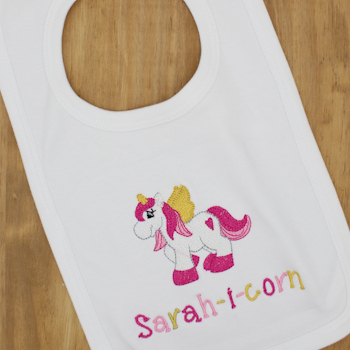 Personalised baby bib embroidered with adorable unicorn pegasus pony motif and name -i-corn. Personalised baby bib embroidered with adorable unicorn pegasus pony motif and name -i-corn. This white bib is good quality made in the UK 100% double layer cotton pullover bib easy on and off. Custom embroidered with cute unicorn motif and multi coloured name -i-corn added for that quirky touch.